Revised edition, January 2017. 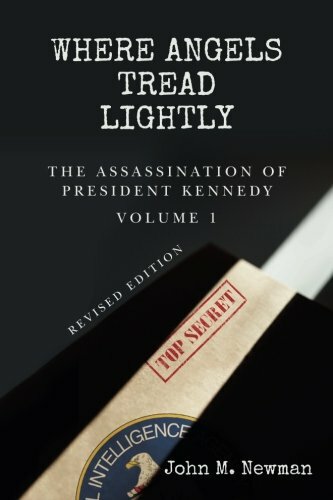 The first in a series of volumes on the JFK assassination, Where Angels Tread Lightly is a unique scholarly examination of historical episodes that go back to WWII, the Office of Strategic Services, and the early evolution of the CIA—up to and beyond Castro’s assumption of power in Cuba in 1959. This book is a groundbreaking investigation of America’s failure in Cuba that uncovers the CIA’s role in Castro’s rise to power and their ensuing efforts to destroy him. This work retraces the paths taken by many of the key players who became entangled in the CIA’s plots to overthrow Castro and the development of the myth that Castro was responsible for the assassination of President Kennedy. With rigorous scholarship and the brilliant insight of a trained textual records interpreter and document forensic specialist, Dr. John M. Newman sheds new light on the multiple identities played by individual CIA officers. Where Angels Tread Lightly deciphers the people and operations that belong to a large number of CIA cryptonyms and pseudonyms that have remained, until now, unsolved.